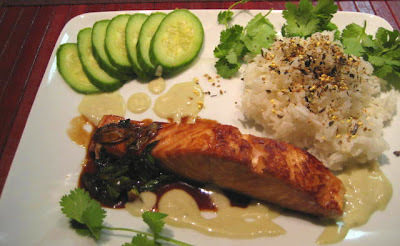 With rice, cucumber pickled in seasoned rice vinegar, ginger-teriyaki and wasabi-mayonnaise sauce. That is pretty much whole recipe. Slice cucumber and marinate in 1 part rice vinegar and 1 part honey mixture. Sprinkle with white pepper and toss to coat all slices. Mix 1 tsp. wasabi powder with 1 tsp. water to make paste. Add 2 Tbs. of mayonnaise and mix until smooth. It should have a consistency of pancake batter. Marinate salmon in teriyaki sauce for at least half an hour but no more then 1 hour. In a non-stick frying pan heat up 1 tsp. of peanut or grape seed oil and few drops of sesame oil on medium high heat. Remove salmon from marinade and wipe dry. Reserve the marinade. Place boneless and skinless salmon file belly side down into frying pan and sear till light golden brown color develops, about 3 minutes. Turn over to skin side and cook for another minute or so. When most of pink on side of fillet changes color, remove to preheated plate, cover with aluminum foil and keep warm. Wipe off remaining oil and put in chopped ginger and remaining marinade. Cook on medium heat till sauce thickens a bit. Keep warm. On preheated plate place steamed rice, salmon and drained cucumber slices. Drizzle reserved teriyaki sauce on one side if fillet and wasabi-mayo sauce on other side. Garnish with coriander (cilantro) leaves . Note: In summer I serve this dish at near room temperature with cooked and cooled rice vermicelli instead of rice.